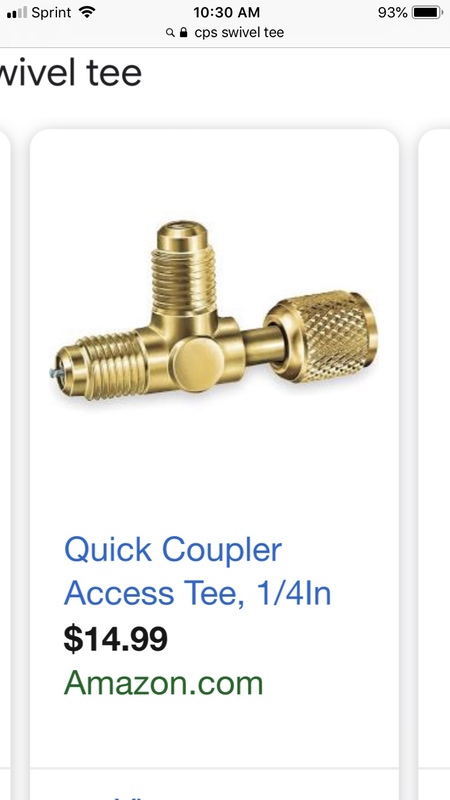 What exactly do you use to add charge just an access tee?? Yes, and I use the thumb screw style core depressors to connect to a system to reduce refrigerant loss to the minimum possible. It all fits neatly in the case that comes with the JL3 kit. I’m using the low loss 90° adapters from Yellow Jacket, but high pressure and the large size of the fitting sometimes makes it difficult to screw on. I’m liking the thumb screw style. What brand are those. I saw some bad reviews on the C&D. I hope the seals are more reliable. Last edited by mgenius33; 04-14-2019 at 11:21 PM. The C&D ones are garbage. I get the core depressors on ebay, the seals are PTFE and stay in, unlike the unsecured o-ring in the C&D ones. They also fully back seat if you back off the thumb screw enough. AccuTools has one, but I've no idea what kind of seal it has, or if it back seats. They look shorter than the ones I have, so I may order a couple from TTT to try out. I also keep a couple of 90º low loss fittings for connecting to service ports in tight areas. I have an extra air probe for outdoor temperature, and will likely order an extra temperature clamp for discharge line temperatures and an extra pressure probe as a spare this week. Too bad my Sporlane probes won't work with MQ, or I'd already have spares. Thanks, I saw the bad reviews on the C&D's just before I ordered them, so I stopped. I just ordered a pair of the eBay ones you linked. The drawback is that it will likely be 2-4 weeks before you get them.